Castle Green is in the heart of Hereford City, within easy walking distance of the Cathedral, High Town shopping centre and markets, the modern shopping centre with restaurants, cinema & additional parking of The Old Market and the River Wye. Drop down to Victoria Footbridge and cross the river to Bishops Meadow and Hereford Leisure Pool, tennis courts, children’s playground and plenty of space for an impromptu football game. 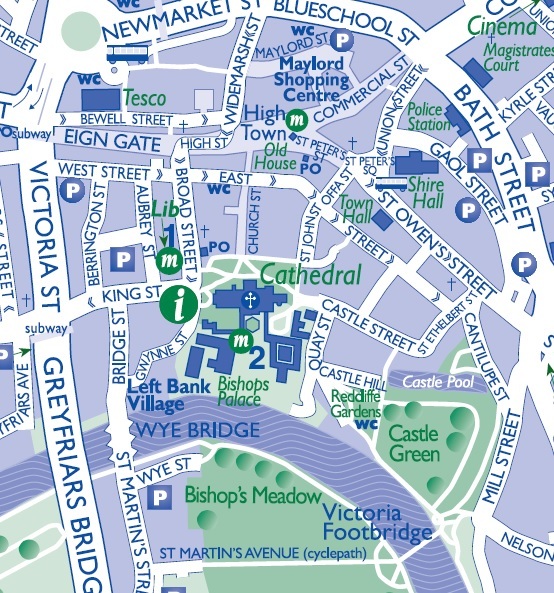 There is no parking at the venue but there is 30 minute parking on the surrounding streets at present (Castle Street and St. Ethelbert Street). The Leisure Pool has a large car park, Wye Street and Gaol Street car parks are only 5 minutes walk away and there is ample parking elsewhere in the city.